We are going to do another centering. In this centering we are going to create a workshop and I want you to really let your imagination take over now. We are going to create a building and I want you to really get physically involved in this by actually using your hands to create the walls and the floor and the ceiling and the roof, the windows and the doors. To create the furniture inside, to create any machines inside that you may want to have. For example, ever watch Star Trek? 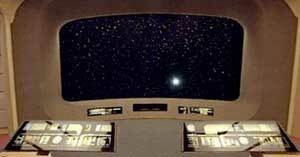 Well in my workshop I have a nice big chair just like Captain Kirk used to have with a big screen right in front of me and my workshop look like the bridge from the Starship Enterprise. Of course with a few custom additions! I also like to have a big glass dome over my workshop so that I can look at the stars at night. This also helps to keep me connected to Buckminster Fuller who designed the geodesic dome. Then I have some machines in my workshop. I have an enthusiasm machine that I plug right into my bellybutton. Why? Because I need enthusiasm! Anybody here need more enthusiasm? And I also have a vision machine in my workshop. Has anybody ever seen those virtual reality outfits? I put one of those on to help develop my vision, where I am going in my life. Does anybody need more clarity about where they are going in their life? We are also going to build a communication centre in our workshop to improve the quality of our communications. Does any body need better communications? What I want you to do now is to let your imagination take over. Once we get our workshop built we are going to create a large white light over the front door. Has anyone seen any white light in their centering so far? And, when we have done that we are going to come back out of the centering and take some time to write down what we have created in our workshop. I now begin creating my workshop. I let my imagination go, using my hands, I become animated, building walls, putting in the windows and a yellow door to the workshop of my mind. I place a large white light about my workshop doorway. Whitelight represents my energy, a pure source for healing and rejuveniation. I build my communication centre and I put in a screen for visualization. Once my workshop is complete, I find a comfortable place to sit down and watch the screen of my mind. For the next few minutes I will remain centered and I will experience and visualize whatever I am led to see and experience. Excercise: In your Journal, describe your workshop. Start your description with: "THE WAY I FEEL ABOUT MY WORKSHOP IS..."
Excercise: Go back over what you have written in your journal and change the word WORKSHOP to SELF and re-read it. Journal your experience. As we are going through our day to day lives where do we spend most of our time, and our thoughts and our feelings? Does anybody ever feel angry? Upset? Who has got some thoughts. Angry. Resentful. Hurtful. Negative. Unsure. Low self esteem. Pity party. What else? What else is there. Unloved. Unwanted. Poor me. I don't feel good. I don't feel worthy. Are you getting all this down? In Lifestream we have a name for all this. We call this the GRUNGIES. How much of your life do you spend in the Grungies? 75%? 90%? 60%? 100%? You must be depressed. You must be really depressed. Do we have a choice to live in the grungies? Leaders make mistakes and say, "I made a mistake," and make up for it. Victims make mistakes and say, "I'm sorry," but do the same thing the next time. Leaders say, "I'm good, but not as good as I can be yet." Victims say, "I'm not as bad as a lot of other people." Leaders get compliments and say, "Thank you." Victims get compliments and make excuses or jokes. Leaders stand FOR something and are willing to fight FOR it if necessary. Victims stand FOR nothing and fight against everything...even themselves. "There are essentially two categories of people in the world...leaders and victims. Victims are those whose purpose seems to be to criticize and resist leaders until they become victims. Leaders are those whose purpose seems to be to inspire and motivate victims until they become leaders." We can choose to be a VICTIM OF CIRCUMSTANCE, or ACCOUNTABLE FOR THE RESULTS IN OUR LIVES. You see we all have circumstances in our lives and we can choose how we view those circumstances. We can see people as a threat and REACT NEGATIVELY. Or we can view people and circumstances as an opportunity and PROACT POSITIVELY. To illustrate this point Jim, would ask for a volunteer to be "a victim" and to come up to the front along with five more volunteers as "circumstances" to come to the front. One hold each foot. One hold each wrist. And one to hold around the waist. "No fooling around!, Jim would then ask our "little victim" to walk to the door. The victim would fight and squirm for a few moments and Jim would ask, "What's wrong? Why don't you get to the door?" The victim would give some excuses and Jim would say, "I submit it was your intention to not go to the door." Adding further, "Well did you have some options? You could have asked them to let you go to the door. You could have offered them a $100 to go to the door. Did you have some options? Did you react or did you try to proactively resolve the situation?" "I submit to you THAT INTENTIONS AND RESULTS ARE ALWAYS THE SAME! Exercise: In your journal write this statement: "A result in my life is...(cite any circumstance, feeling, or issue in your life)...it was my intention to have this result...I did it on purpose." Repeat this at least 10 times. Journal your thoughts on your experience. I am going to tell you a story about GEORGE, but I want you to pretend that you're George. What's your name? That's right, it's George! Now George lived in this town with his wife and he had worked for the same company for 20 years! Every day he faithfully show up and worked with the President and owner of the company to make it a success. Now one Monday morning, George arrived at his desk, on time as usual, and there was a notice there that the long time Vice-President was retiring. Alongside that notice was a personal, hand written, note from the President to George saying that he wanted to see George in his office first thing Tuesday morning! What's your first thought George? Promotion? More money? New car? Do you rush home that night and tell your wife all about it, George? And what is her first thought? New sofa! New drapes! Perhaps that cute little house over in Cabbagepatch with the white picket fence! Now, when you go to get ready for work the next morning George, how are your clothes laid out? What kind of breakfast has your wife prepared for you? And what kind of kiss do you get as you are going out the door? Now you arrive at the office, a little earlier perhaps, and are you excited George? At 9:00 o'clock sharp you knock on the President's door and the President says, "Come on in George and sit down." He continues, "Now as you know George, the Vice-President is retiring and I want you to be the first to know that I am bringing my nephew Horace from Pittsburgh to be the new Vice-President, and I want you George to train him to run the company." What are you feeling George? Resentment? Anger? BetrayalL? Hate? Resentment is always the first reaction. Well, what do you think happened when George went home and told his wife what the boss had said? How did she feel? How were George's clothes laid out the next morning? Do you think he had to go to the laundry hamper himself to find his socks? What kind of breakfast was waiting for him when he got downstairs? What kind of kiss did he get going out the door? The truth of this story is that the President was dying of cancer, and for insurance reasons, he couldn't tell anyone. He had brought Horace in to become Vice-President so George could become President and run the company. However George didn't know this and did become resentful toward the boss and the company. He started taking a little money out of petty cash. After all he deserved it. He had worked heart and soul for the company for 20 years. After a few weeks George was caught stealing and was fired. Both he and his wife became hopeless alcoholics. They lost their house and got divorced. The President died from his cancer, and because Horace couldn't run the company, and it went bankrupt. Resentment is followed by resistance and resistence is followed by revenge. Did George have some options? Could he have said: "I am going to train Horace and we are going to build a better company"? Or, George might have said, "Thank you very much and I quit." Did George have some options? But when he chose resentment, look what happened. What happens in your life when you chose resentment? People have told me that the exercise we are going to do now is one of the most important parts of the Lifestream Basic seminar. We are going to engage in a process of forgiveness. In this cycle we are going to look at something someone has done to hurt us in the past. We will then release any anger or resentment we may be holding on to as a result of their actions. Next we will look at a current situation in our lives in which someone is causing us any kind of trouble, be it anger, resentment, guilt, or shame and we will release them from our resentment. Then we are then going to look at ourselves and our own behavior and how we have caused ourselves pain and anger and look at ways we can love ourselves, forgive ourselves and accept ourselves. For the best results, one should record this script in their own voice and then play it back to themselves while sitting in an open-body position and participate in a very animated and intense way. Remember to voice what you are going to say with "full power and with all of your ENERGY be ready to really let go of "it" and release all of your anger, resentment, guilt, pain and sorrow. Close your eyes, and cup your hands out in front of you as though you are holding someone's face. Visualize someone from the past who has hurt you. Someone you are holding anger and resentment towards. See their face in front of you. Now at full power begin to say YOU HURT ME AND I AM ANGRY, YOU HURT ME AND I AM ANGRY, YOU HURT ME AND I AM ANGRY (Continue this for 2 to 3 minutes). Now I want you to reverse the polarity and see that person with their hurt, their sorrow and their disappointments and say to them I LOVE YOU, I ACCEPT YOU EVEN THOUGH I DON'T UNDERSTAND YOU. (Continue this for 2 to 3 minutes). Now, visualizing that person, put your left hand on their heart and use your right hand to pull their left hand to your heart and say, "I WAS HURT AND I FORGIVE YOU (Continue this for 1 to 2 minutes). Now, seeing that person, reach up and pull the mask off the face and see that person inside as a four year old child. Pull the mask off and say, "I LOVE YOU, I FORGIVE YOU AND I ACCEPT YOU. (Continue this for 1 to 2 minutes). Now we are going to bring someone presently in your life. Someone who is causing you hurt, pain, anger, or resentment. Cup your hands out in front of you again and hold their face in your hands. Now say to them with full power I WAS HURT AND I AM ANGRY (Continue this 2 to 3 minutes). Switch polarity, see them with their hurt, their sorrow, their disappointments, their broken dreams. Look deeply into their eyes and say I LOVE YOU AND I ACCEPT YOU, EVEN THOUGH I DON'T UNDERSTAND YOU. (Continue this 2 to 3 minutes). Now, Put your left hand on their heart and with your right hand pull their left hand to your heart and say I WAS HURT AND I FORGIVE YOU (Continue this for 1 to 2 minutes). Now, pull off the mask on their face and see the four year old child inside. Look at them. And say I LOVE YOU AND I FORGIVE YOU AND I ACCEPT YOU. (Continue this 1 to 2 minutes). Put both of your hands over your own heart. Put both of your hands to your chest. Put them over your heart and say, "I'VE BEEN HURTING AND I FORGIVE MYSELF. (Continue this 1 to 2 minutes). Now, Look up into your own face. Pull off the mask and see yourself as the four year old child. Just see yourself as a young child in front of you and say I LOVE MYSELF, I FORGIVE MYSELF AND I ACCEPT MYSELF . (Continue this for 1 to 2 minutes).